The Amman citadel, named Jabal al-Qal'a, lies in central Amman on top of a hill overlooking the city. The area has been settled since the paleolithic age for over 18000 years. 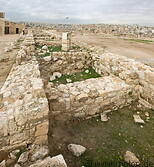 Most older structures were destroyed by the Romans, who cleared the area to make space for new construction. The Umayyad complex and the temple of Hercules are the most significant structures left today.